The effects of falling into cold water can be serious. 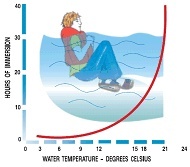 The shock of sudden immersion into cold water can kill long before hypothermia. When a person falls into water less than 15°C the first reflex is to gasp and then hyperventilate, during which it is extremely difficult to hold breath. The heartbeat may become very fast and irregular during this time. There is a high danger of drowning if the head is not kept above water. It may take several minutes to regain control of breathing and be able to climb back aboard if this remains possible. 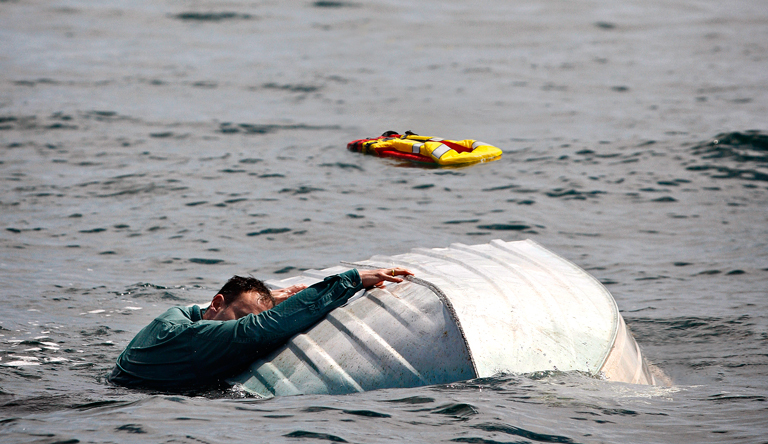 Strength and coordination weaken quickly in cold water, typically in ten to fifteen minutes, so it is important to inflate lifejackets and rafts, and set off EPIRBs quickly for the best chance of survival and rescue. Prepare flares and signals next, so they are easy to access and deploy when help arrives. Activity such as swimming will increase heat loss. Hypothermia commences when the body core temperature reduces, typically within an hour of immersion. 1 to 3 hours before you become unconscious due to hypothermia. The term 'hypothermia' means lowering deep-body or core temperature. 'Immersion hypothermia' is an acute type of hypothermia produced when a person is immersed in cold water. An adult of average build could not expect to survive more than three hours of immersion in midwinter. The time is very short when you consider the time lost before a search and rescue operation is under way. The heat escape lessening posture (HELP) combats hypothermia and can be a lifesaver to people in cold water. The HUDDLE position can also be used if there is more than one person in the water. To reduce body heat loss, make sure you stay close (huddle together) and remain still. WARNING: the consumption of alcohol, attempting to swim or movement in the water will cause the body to use up heat rapidly, which will hasten the onset of hypothermia. When recovering a person from cold water, keep them lying down if at all possible to reduce the load on the heart. Treat the cold person as for hypothermia and watch carefully for breathing difficulties due to intake of water.